Ask a Native Speaker to Review Your Sign! I saw a sign over a pizza joint yesterday. It said, "Minute Pizzas and Great Salads." This will be a fun slogan to present to some of my ESL students. Of course, the owner's intention was to imply that you could get your pizza there quickly. But as native-English-speakers know, this word has two different pronunciations. Depending on the pronunciation, "minute" can also be an adjective which means very, very small or unimportant or insignificant. I don't think that was the intention of the pizza joint owner! 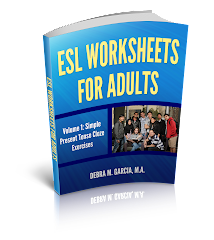 When I first started privately tutoring ESL students, I didn't have a system in place for keeping track of my lessons and topics covered. This wasn't a big problem for the first few lessons and when I had very few students. However, as the number of students grew and time passed, I wasn't able to remember everything. Especially since some students study English with me for a long time. It hasn't been unusual for some learners to work with me for over a year. At some point I realized that I needed to keep better track of what had been covered. I thought of a checklist of sorts, but that didn't work very well, as different students had very different needs. I have always prepared a one-sheet lesson plan for every tutoring session. Even if it is just a conversation class. During class, I use this piece of paper to make notes to myself about what has been covered and what needs to be covered in the future. Having a lesson plan also shows the student that you are a professional and they seem to appreciate the time you take to prepare for class. I also have a folder for each student. You usually never know for sure how long you'll be working with a student, so keeping track of your lessons can be very useful. I think it's essential (for my own sanity, if nothing else!). So many of my ESL students over the years have been absolute geniuses. Of course, I didn't conduct any tests to verify this, but I think I'm right. A lucky thing for me is that these English language learners have also been absolute joys to work with: very personable, considerate, kind, and open to learning. Yet another one of the fringe benefits of being an ESL tutor. Another disadvantage of being self-employed is that there is no sick leave! I’ve been under the weather for a few days and have had to cancel two days of classes with my ESL students. I’ve found it interesting to note all the home-based-business opportunities out there that tell you you can set your own hours, make the income you want, etc., etc., etc. Well, I suppose that is true for some, but what I’ve found to be more true for myself and others is that as a self-employed person, I’m seldom really not working. With websites, there is always more to do. More emails to answer. More pages to write. More corrections to make. More research to do. Although being a self-employed ESL tutor does have some downsides (e.g., no sick leave, no vacation leave), I still would never trade it for a “real” j-o-b. I've added an Irregular Verbs List to my main website. This may be helpful for English language learners (and many native-English-speakers--including myself!) when using some verbs in the Simple Past and any of the Perfect tenses. I'll try to turn it into a pdf so it's easier to print out just as soon as I remember how to do it! Being a self-employed ESL tutor is very rewarding work. I've mentioned before how it enables me to "travel vicariously" and meet many incredible and interesting people from all over the world. It also helps me to continue to (partially) see my own country through non-American eyes. I really enjoy this part. One of the more time-consuming and challenging parts of being self-employed, but still working with other people, is all the schedule juggling I have to do; and the time-consuming emails I have to write after I try to figure out everyone's schedule. Of course, if I did not have to depend upon my income from teaching ESL, I wouldn't spend so much time trying to juggle everyone's schedules. I can see you at 3pm on Thursday, the 17th. Please confirm if this time works, or if you need 3:30. I have you confirmed for Thursdays (starting July 24th) at 1 p.m.
My schedule has just gotten crazy lately, so I'm sorry about my limited availability. I often have cancellations, so whenever I have one, I could let you know right away so you can decide if you would like to take the class." This email was to a new ESL student. Usually, after we get started and establish a regular schedule, that schedule is good for a few months (until life circumstances change, such as a new semester begins, or a work schedule changes, etc.). I should probably also point out that the above email was to a very advanced ESL student. For newer English Language Learners, my emails (especially around logistics) are a lot more succinct and direct. "Hi! 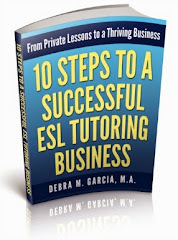 I was reading on your blog that you have an ebook about setting up an ESL business. I'd be very interested to take a look at it. I've had my own business in a specific niche market for a few years now (teaching English to Japanese speakers, mostly businessmen) but I'm looking to branch out and create a dispatch service for ESL teachers in my area (New York city). Could you give me some pointers on advertising the business and recruiting students? Thank you for contacting me. I'm currently working on the e-book and am glad to let you know as soon as it is finished. I'll probably send a draft out to a few people for free if they are willing to give me comments and critique the book. As for advertising, I only use craigslist.org. It should be useful in your area as well. You may also want to look at the "advertising/marketing" section listed under "Article Topics" on this blog. Hi. I'd like to know what's the best coursebook for Portuguese students, who are learning English (100-150h) for the 1st time? Can you suggest the one you consider the most adequate and effective? I have used a few series of books out there for classrooms, such as Focus on Grammar and New Interchange. They are both adequate. As for effective, I'd say they are as effective as any other books. It depends on how you use them and what supplemental material you use. These are ESL textbooks for adults. You didn't mention if you're teaching children or adults. I don't have any recommendations for children. If you're teaching one-to-one, then see my ESL Textbook Evaluation page for the books I use. Here's another American holiday to discuss in a conversation class. However, since the point of a conversation class is to get the ESL (or EFL) students speaking, this topic could be a launching point to hear about holidays in your students' home countries. I've mentioned before that I advertise for new ESL students on craigslist.org. I never put my phone number in the advertisement, just my email address. If potential students want to contact me for English lessons, they have to email me first. I received an email inquiry today with an interesting greeting. The writer wrote, "Excuse me" as his greeting. I've received hundreds of email from English language learners and this was the first time I've read this introduction. Of course, a more appropriate email opening is something like "hi" or "hello" or "good day" (although emails with "good day" are usually from scammers), etc. I was thinking about this "excuse me" email greeting and although it's not conventional, it really does seem to a polite way to begin an email. I receive so many emails from potential students, people who have viewed my websites, friends, family, businesses, and on and on. I get a little overwhelmed with all the email sometimes. So "excuse me" just seems like a fair greeting. (Of course, I am not recommending this greeting in emails. It's more appropriate for speaking situations. And if I end up working with this person, it will be something we discuss.) It just seemed right today.